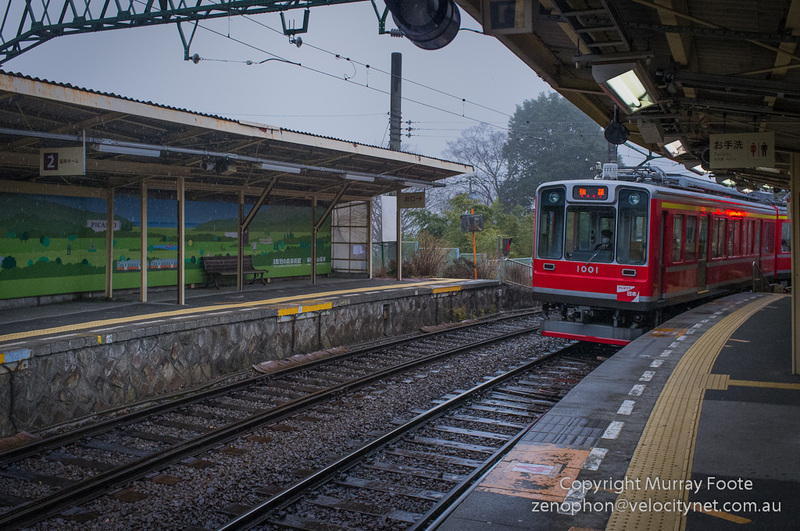 Here I am at the train station for the Hakone Open Air Museum on a rainy afternoon with the train arriving. This is a private line (not Japan Rail) and one of the guidebooks describes it as “one of the slowest trains you are ever likely to ride on”. They are not kidding. Here there appears to be two tracks but that’s only at the station. Mostly there’s just one track for trains going both ways and places where a train will pull of into a small siding to let an oncoming train go past. This means that when you get going again, you are facing the other way around. Quite a contrast with the bullet trains. 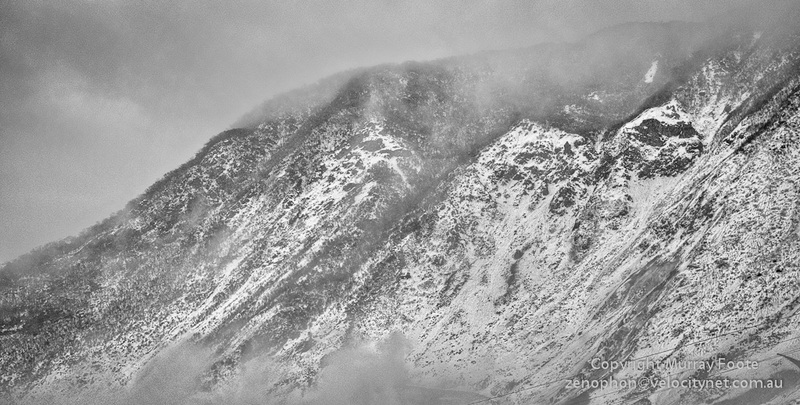 A car from the Hakone Ropeway near Owakudani in the rain, through raindrops on the window. 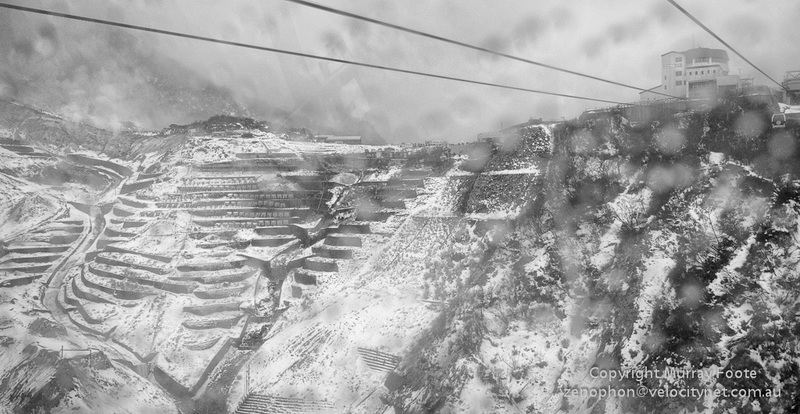 Not the best of weather to try to take photographs from a Ropeway cablecar. 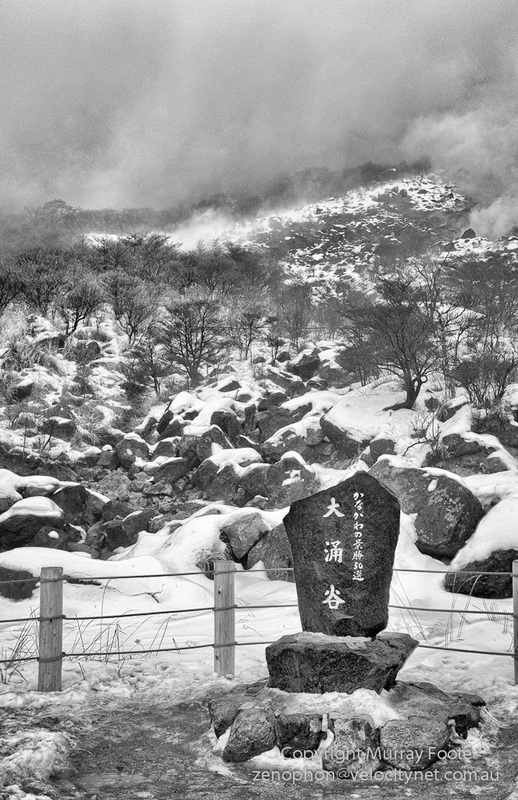 From almost the same viewpoint as in the previous image, Owakudani Station is on the top right and we can see the extensive terracing in the valley. I don’t think this has anything to do with preventing landslips. My guess is that they are paddy fields many hundreds of years old, though not used for that purpose any more. Remember, it’s winter now so there would usually be no snow in summer and rainfall might be higher than lower down. Some of the terraces that we see here have square shapes against the walls and these appear to have pipes going down to them, presumably for irrigation and there are many triangular assemblies, presumably to protect shrubs or trees. Perhaps grape vines or fruit trees. I alighted at Owakudani Station and took this image from near there. 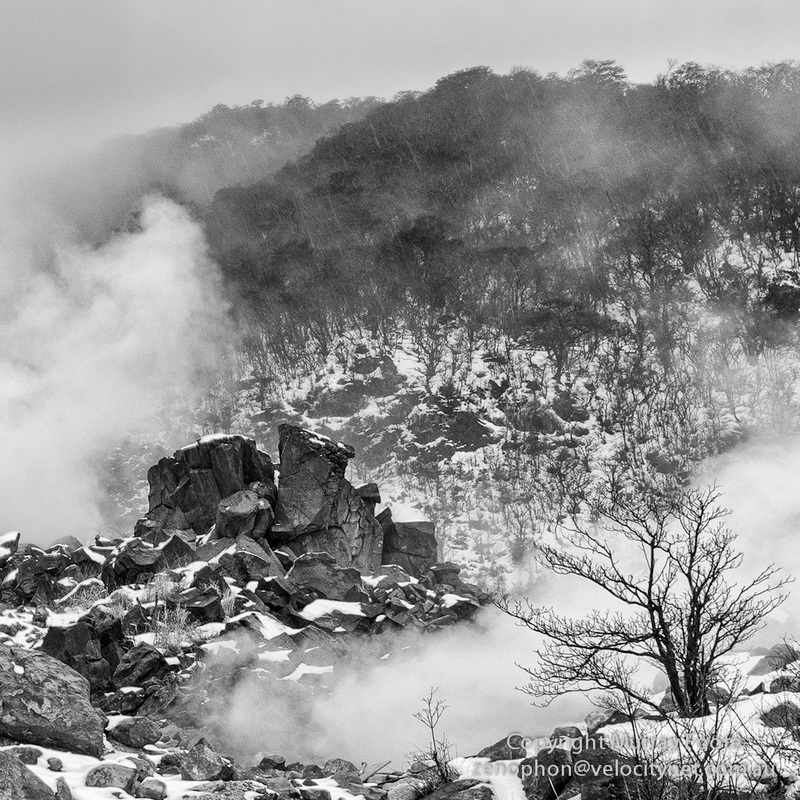 Owakudani means “great boiling valley” so while there is rain or snow, clouds and mountain mist, there is also large amount of steam escaping from the ground through fumaroles. I kept on going along the ropeway to Lake Ashinoko. 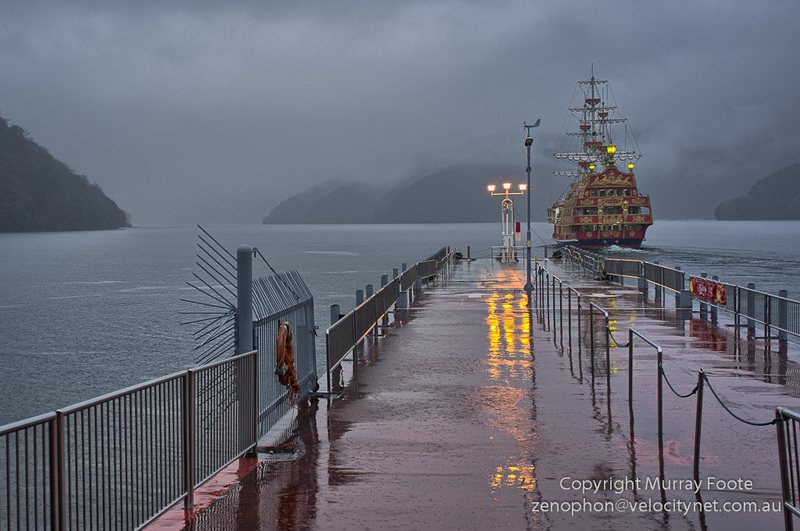 There was supposed to be a view of Mt Fuji along the way, but not chance of that in this weather. It didn’t look good for the next day, where I had arranged to stay at Lake Kawaguchi for the chance of a glimpse of Mt Fuji. 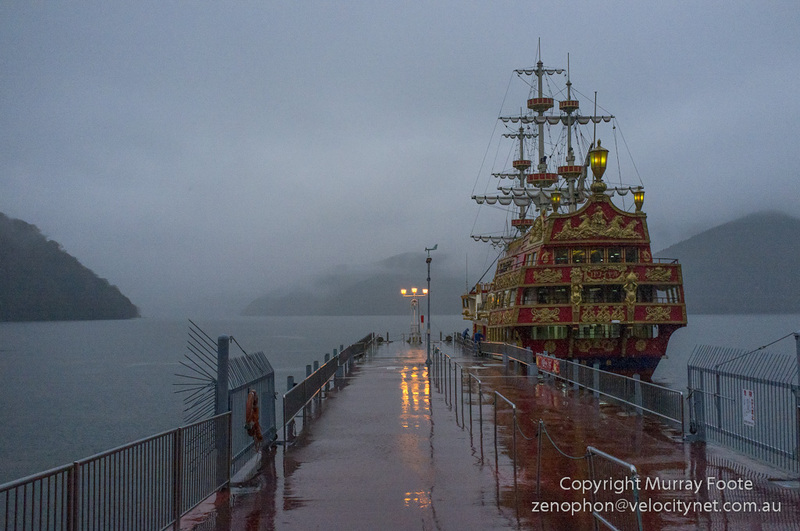 I arrived at the end of the line at Lake Ashinoko, just in time to board the replica pirate ship. 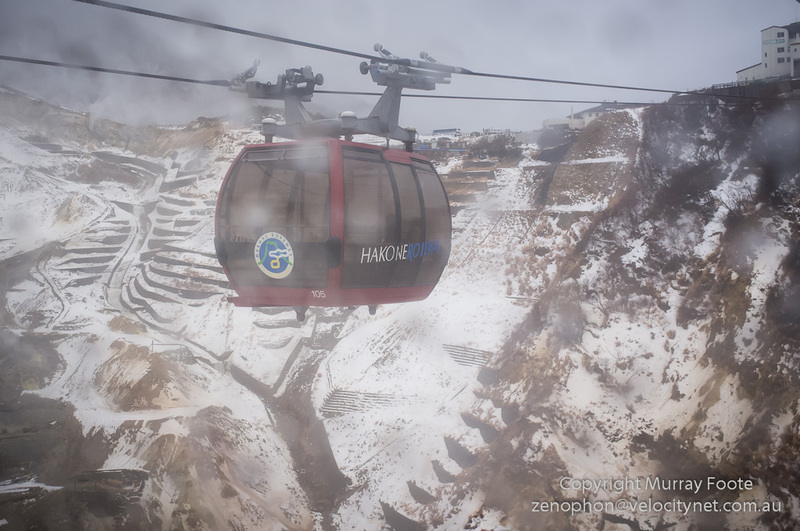 However, it wasn’t coming back and I hadn’t researched transportation at the other end of the lake, so I elected to turn back and return by the Hakone Ropeway. They wouldn’t let me get any closer along the wharf. All the shots in this post and also the previous one were taken with my “pocket camera”, a Fujifilm X100. This also was the point at which the battery died and I hadn’t brought the spare – though I was starting to run out of light anyway. 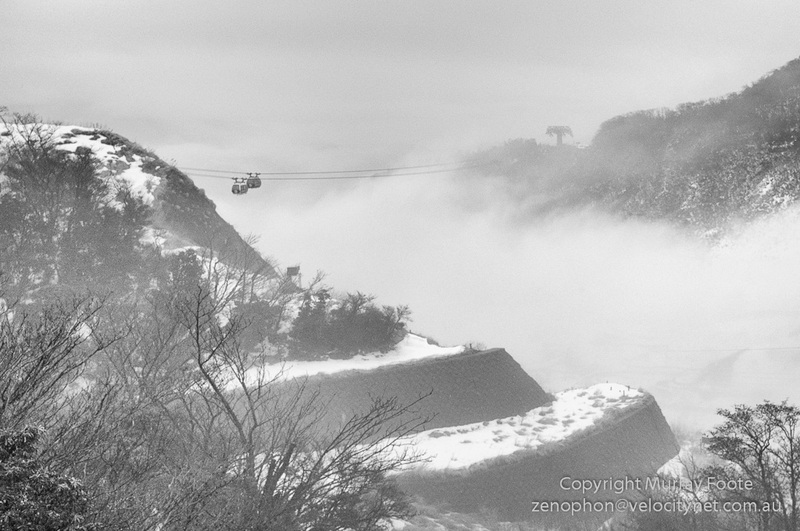 This entry was posted in Hakone, Japan and tagged Hakone, Hakone Ropeway, Japan, Lake Ashinoko, Owakudani, Photography, Travel. Views 6 & 9 are very good. A beautiful if very cold location. Thank you.